WHAT: Filmic Light - Snow White Archive is a non-commercial site dedicated to the documentation of all things Snow White, with particular emphasis on Walt Disney's 1937 animated masterpiece. WHY: The goal of the Filmic Light is to gather in one online locale as much accurate Snow White reference material as is possible--in particular clear photographic imagery--from historical documentation on the making of the film to memorabilia and merchandise, contemporary fan art, cast members, theme park rides and more. 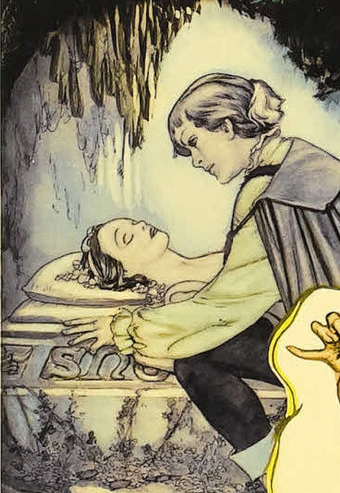 Detail from Gustaf Tenggren's 1937 Snow White and the Seven Dwarfs 40x60 movie poster. NOTE: This blog is not affiliated with the Walt Disney Company or any other corporate enterprise. It is an independent fan site dedicated to all things Snow White.